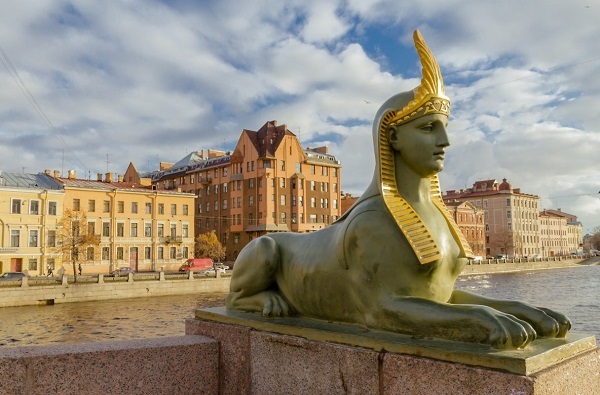 Among the many attractions the Sphinx of St. Petersburg will certainly draw your attention. What are these creatures - sphinxes? The word "Sphinx" comes from the Greek "sphinx". The nations of the world represented these sculptures differently. In Greece it was a mythical creature with wings and the body of a lion or a dog and a woman's breast and head, and in Africa it was a monkey with a narrow noseof the baboon’s genus. In ancient Egypt, the sphinx was called the stone statue of a lying lion with the head of a person embodying the power of the pharaoh. In ancient Egypt, the lions lived beyond the Nile valley, were beautiful and strong. Egyptian sculptors carved stone statues of lions and set them at temples and tombs to protect themselves from evil forces. Later, instead of the head of a lion, they carved the head of the pharaoh and began to believe that the sphinx has the power of a lion and the mind of a person, because the pharaohs were considered as messengers of the sun god Ra. Amenhotep III was born in the ancient capital of Egypt, Thebe, located in 700 kilometers to the south of the Mediterranean Sea. He took the throne still quite a boy when he was about 10 years old and ruled approximately in 1388-1351 BC. During his governing, a grandiose building was launched. Great temples and monuments of sculpture were built, trade developed, and created at that time works of art make up the best collections of museums in the world. On the avenue leading to the palace of Amenhotep III, the sphinxes stood, guarding him from evil forces. In 1820, during the excavation of ancient Thebe, the Greek Janis unearthed two sphinxes of syenite, whose face was a portrait of Pharaoh Amenhotep III. On the head of the sculptures was a double crown, embodying power over Lower and Upper Egypt, and the cobra in the form of decoration symbolized patronage and protection. After Napoleon's campaign in Egypt in the beginning of 19th century in Europe, the fashion began all from the East, and primarily on works of art and architecture. St. Petersburg did not stay aside from this new trend as well. In the northern capital the Egyptian bridge has appeared, in the Tsarskoe Selo - the Egyptian pyramid, and in Pavlovsk - the Egyptian vestibule. After the Russian-Turkish war of 1828-1829, a young Russian officer, Andrei Nikolayevich Muravyov set out to travel through Syria and Egypt. One of the sphinxes which was found in Thebe has been delivered for a sale to Alexandria. Here A.N.Muravyov saw this unusual statue and admired this work of art, sent a letter to the Russian ambassador with an offer to buy sculptures. This request was redirected to St. Petersburg to Nikolay I. After the approval of the purchase by the Council of the Academy of Arts, it was decided that the acquisition would be expedient for Russia. By this time, the French government had already bought the sphinxes, but with the beginning of the revolution in July 1830, the French government didn’t think about the sculptures and such possibility was assigned to Russia for 64,000 rubles. At the end of May 1832, the values, each of them weighed 23 tons, with the utmost care, loaded onto the Italian sailing vessel Buena Speranta, which means "Good Hope" and a year later the sphinxes were delivered in St. Petersburg from hot Egypt. The sculptures had been staying in the courtyard of the Academy of Arts during two years and until that period of time on the Neva opposite the building of the Academy, a granite quay was built on the project of Konstantin Ton. Originally for its decoration it was planned to install bronze compositions "The taming of a horse by a man" by Peter Klodt. But this work did not suit the allocated budget, and in April 1834, Egyptian statues were set up on the granite pedestals at the pier on the University embankment. The beaten beards of sculptures are still ancient Egyptian damages. On the pedestals, the inscription "The Sphinx from the ancient Thebe in Egypt was transported to the city of St. Peter in 1832". On the statues you can see a lot of hieroglyphs, which in 1912 were translated by an Egyptologist, and later academician Vasily Vasilyevich Struve. These inscriptions represent the full name of Amenhopet III, the incarnate god on earth: "Let Horus lives, a mighty corpse, shining in truth, which established the laws, and calmed both lands. The Golden Gore, Taurus of kings, the conqueror of nine bows. King of Upper and Lower Egypt, ruler of both lands of Nebmatra, the son of Ra. The son of Ra, his beloved Amenhotep is the ruler of Thebe, the image of Ra before the two Lands. Gore is a kind lord of eternity, to whom life, permanence, happiness, and health are given". According to the model of the master P.P.Gede bronze lamps and two winged lions were poured out, they were set up closer to the water. At the end of the 19th century, winged animals disappeared and they were restored only in 1959, when in the foundry workshop of the Academy of Arts, in accordance with model of the master G.F.Tsygankov new sculptures were poured out. The authors of the project were architects I.N.Benois and A.E.Polyakov.In 2007, after the reconstruction of the Annunciation Bridge and the pavement, lights were interchanged. But as a result, the lampposts spoiled the image of the pier. After the appeal of the citizens of St. Petersburg, the historical view of the monument was restored.